Adam Nash lives in Crockerton, Wiltshire with his wife, young family and large Rhodesian Ridgeback dog. A former Infantry Officer and having opted for a career change, Adam spent a number of years training under a local Master Thatcher before setting up his own business. In 2005 Adam was awarded scholar status/ a scholarship by the Queen Elizabeth Trust, a body linked to the Royal Warrant Holders Association, in recognition of his thatching and commitment to a traditional British craft. Adam is also a member of The National Society of Master Thatchers, his work has been inspected and externally validated prior to being invited to join the Society. 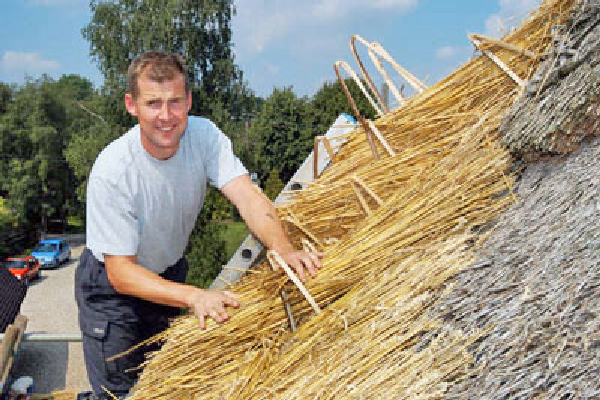 As a potential customer you can be secure in the knowledge that Adam fully supports the Societies aim of "promoting excellence in thatching" and maintaining their reputation for the highest standards of workmanship.